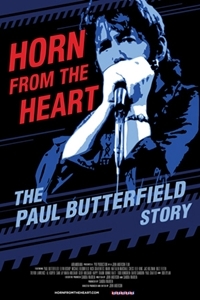 Synopsis: "Horn From The Heart: The Paul Butterfield Story" is a feature-length documentary about the life and career of legendary blues musician Paul Butterfield. A white, teen-age harmonica player from Chicago's south side, Paul learned from the original black masters performing nightly in his own back yard. Through his music and words, along with first-hand accounts of his family, his band mates and those closest to him, "Horn From The Heart: The Paul Butterfield Story" tells the complex story of a man many call the greatest harmonica player of all time. The Paul Butterfield Blues Band was inducted into The Rock and Roll Hall of Fame in 2015.